That would be the word that best describes Novell, especially at times when Microsoft tries to erase its past crimes. And Novell is just letting it be. Novell not only forgives Microsoft, but it also promotes Microsoft technologies such as .NET and OOXML. Novell even fuels Microsoft's patent FUD against Linux in order to market itself. 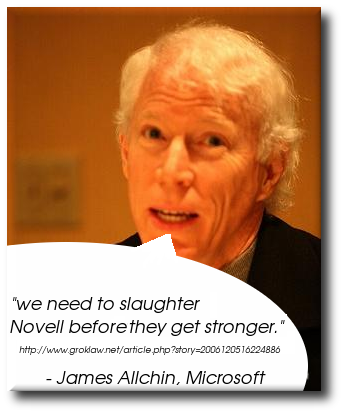 There is nothing that Novell won't do for Microsoft. Pathetic is a weak word. Suicidal morelike. Here is what Matt Asay has just had to say about “The bizarre relationship that is Novell + Microsoft”. In an email dated October 3, 199, however, Bill Gates ordered his top executives to retract the documentation of the browsing extensions, but only until Microsoft’s own developers of the Office suite of applications had sufficient time to work with the hidden extensions to build an insurmountable advantage over competitors such as WordPerfect. Gates further explained that without this advantage, Office would not compete with the major ISVs. This is just the sort of company that I’d want to bet my Linux business upon. Wouldn’t you? Point well taken that it’s a heterogeneous world that requires odd pairings of companies. But given Novell’s understanding of just how bad Microsoft can be, is a partnership the best way to reward that behavior? Asay is pointing to this new article from the Register. Microsoft is asking the Supreme Court to strike-out a multi-billion dollar word processing monopoly lawsuit from Novell. On the day the lawsuit was filed, Microsoft blamed WordPerfect’s downward spiral on “poor business decisions” and “mismanagement” by Novell. WordPerfect, a once-popular software program, is making something of a comeback – this time as Exhibit A in Novell Inc.’s multibillion-dollar antitrust suit against Microsoft Corp. Novell briefly owned WordPerfect in the mid-1990s and says Microsoft’s anti-competitive tactics undermined the product. WordPerfect’s share of the word-processing market. It was only days ago that we mentioned the Bloomberg article that started it all and two days later Novell’s Dragoon published an article actually praising this ludicrous relationship and arrangement. Novell has competed with Microsoft over software business for more than two decades with products including its Linux-based operating system, SUSE Linux Enterprise, which competes directly with Microsoft’s Windows. The two companies remain competitors today, with one main difference: They created an agreement in 2006 that allows their operating systems to coexist on the same computer. The deal involved joint marketing, technical and patent collaborations. - Focus first on the overall agreement. - Gather the right employees to develop the marketing plan. - Stay competitive in the rest of your marketing. - Prepare for a PR backlash.